We eat a lot of broccoli in our house and I make a lot of broccoli-tofu-soy sauce combos, but tonight I broke out of the rut with some quinoa and crumbled up gluten-free veggie burgers to make a really delicious and FRUGAL supper. The kids weren't as impressed as Dan and I, but they are at the age where I can point them to the peanut butter jar if they don't like the main meal at my restaurant. A lot of veggie burgers are not gluten-free, so make sure you read labels religiously. I used Franklin Farms burgers which I find next to the tofu in the refrigerated case at the grocery store. Place quinoa, water and salt in pot and bring to a boil. Cover and simmer on low heat 15 minutes. Turn off heat and let sit 5 minutes. Fluff up with a fork. Saute garlic in 2 Tbsp. olive oil. Add broccoli and stir-fry 3 minutes. 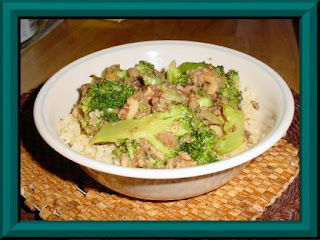 Add 1/4 cup water to pan and cover and simmer 3-4 minutes, until broccoli is tender-crisp. Add veggie burgers and miso and stir until heated through. Thanks for mentioning the brand to look for...I just gave up looking for a GF Veggie burger. I was a vegetarian before I got diagnosed, but gave that up in my inital panic after diagnosis. Now that I've adjusted to the GF lifestyle, I'm ready to go back to being veg too. I wanted to share because I, too, thought I was out of luck for veggie burgers for the longest time until I started discovering them. Unfortunately, here in Ca. I can't find Franklin Farms, but Amy and Gardenburger both offer burgers nation-wide, among others. This recipe looks so healthy and hearty! I just got a book called "Vegetarian Meat and Potatoes" where they do a lot with crumbled veggie burgers- it looks fun. I love all the kitties on your sidebar! So cute!